Repentance was the first message preached by both John the Baptizer (Matt. 3:2) and by Yeshua (Matt. 4:17). In Hebrew, the language of revelation, the word translated as repentance is teshuva, which has root meanings of ‘to turn around’ and ‘to return’. The classic example of teshuvah is found in Yeshua’s parable of the prodigal son and the merciful father. The younger son dishonors his father and goes his own way. The further he goes the worse his situation becomes until, finding himself living in a literal pigsty, he wakes up to reality and makes the decision to return to his father’s house as a servant. to take the necessary action to do so. Whenever we do this, we find our Father is always there, willing to receive us with open arms, waiting to enfold us in His love and to restore us in joyous celebration as His son or daughter. This is particularly relevant when a major ‘course correction’ is made in one’s life. In addition, as we know only too well, regular acts of repentance are necessary to ensure we stay on course! God is Love. It follows that the love of God should be the source of the thoughts that fill our minds, the words we speak, and all we do. Our actions, our deeds or ‘works’, are the end result and the outward demonstration of what we harbor and nurture in our minds and hearts. Any deed that falls short of the expressed will of God and does not honor His Name and build up His Kingdom is a ‘dead work’. It does not flow from the love of the Father, but from one’s self-centered ego and, sadly, undermines the Kingdom of God and serves to build and strengthen the kingdom of the enemy of our souls. This highlights the urgent need to be aware constantly and to examine our lives in the light of God’s Word of Truth. Once we spot the ‘bugs’, the ‘mold’ or the ‘weeds’, He has given us the powerful gift and tool of repentance to eradicate these ‘enemies’ that hinder our growth in righteousness and that cloud His image in us as His children. And joy and gladness are taken away from the fruitful field; and in the vineyards no songs are sung, no joyful shouts are raised; no treader treads out wine in the presses; the vintage shout is hushed (16:10). In contrast he describes how, when “…the Spirit is poured upon us from on high, and the wilderness becomes a fruitful field; then justice will dwell in the wilderness, and righteousness abide in the fruitful field. And the effect of righteousness will be peace, and the result of righteousness, quietness and trust for ever” (32:15-16). We can rejoice in the fact that, as the redeemed of God, “He who supplies seed to the sower and bread for food will supply and multiply your resources and increase the harvest of your righteousness” (2 Corinthians 9:10). Indeed, as the apostle Paul reminds us, “The kingdom of God is righteousness and peace and joy in the Holy Spirit” (Romans 14:17). Thus we see that the constant vigilance of Repentance – dealing with the life-robbing enemies of growth – and the precious fruits of Righteousness go hand-in-hand. Righteousness – a Way, a Life, a Robe, a Temple? There are numerous descriptions of righteousness in the Bible. It is a path to follow, as in: “He leads me in paths of righteousness for His Name’s sake” (Psalm 23:3). It is a way of life to be pursued, “The way [of life] of the wicked is an abomination to YHWH, but He loves him who pursues righteousness” (Proverbs 16:9). And it is beautifully described in the final book of Revelation as a robe of fine linen to be woven and worn by the Bride of Messiah at the glorious wedding feast! “Let us rejoice and exult and give him the glory, for the marriage of the Lamb has come, and his Bride has made herself ready; it was granted her to be clothed with fine linen, bright and pure” — for the fine linen is the righteous deeds of the saints (19:7-8). The concept of a garment of righteousness is also found in the book of Psalms: “Let thy priests be clothed with righteousness, and let thy saints shout for joy” (32:9). This makes an interesting connection between the “priests” of God, those who serve in His Temple, and the Bride. Our God has revealed to us through His Word that His desire from the beginning was to dwell with His people, who were to be to Him “… a kingdom of priests and a holy nation” (Exodus 19:6). 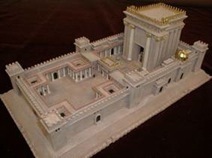 This is evidenced by the construction of the Tabernacle in the wilderness as a place of dwelling for His Shekinah Presence; and then the building of His House, the Holy Temple in Jerusalem. His desire came to further fullness when God “came down” to earth in the person of His Son. The revelation of the Almighty God in His Torah was now also incarnated in flesh in His anointed Messiah. It is good to believe that God is, and that His Word is true, and to do one’s best to live according to His commandments – to be a good and dutiful son or daughter, like the older son in the parable. But, God has revealed that He longs for more… He longs for the “perfect”; which is why Yeshua exhorts his disciples, “You, therefore, must be perfect, as your heavenly Father is perfect” (Matthew 5:48). Oy! Being ‘good’ is enough of a challenge, being perfect seems impossible! Let us consider a few implications of ‘perfect.’ The perfect transcends the good, even as His Being transcends His will, and His Love transcends His Word. The merging of all these elements was revealed in Yeshua himself, the one who lived perfectly. Yeshua’s love for the Father was so great that the undergirding theme for his life on earth was, “Father, not my will but Thine be done!” In awesome humility, he fully yielded his life to Him with total trust in the knowledge that our Father, the King of the Universe, is all loving, all powerful, all holy – perfect! Similarly, as we follow Messiah in the paths of righteousness, and absorb his life into our own, and have our minds renewed by the washing of the Word and our hearts filled with the Spirit of holiness, we will be enabled to “put on the new [perfect] nature, created after the likeness of God in true righteousness and holiness” (Ephesians 4:24). For we are the Temple of the Living God; as God said, “I will live in them and move among them, and I will be their God, and they shall be my people” (6:16). As priests in the Kingdom, we can echo the beautiful prayer of the priest Zechariah, the father of John the Baptizer, which he proclaimed when he received the revelation of the imminence of Messiah while offering fragrant incense in the Holy Place of the Temple: “Blessed be YHWH, God of Israel …that we, being delivered from the hand of our enemies, might serve Him without fear, in holiness and righteousness before Him all the days of our life” (Luke 1:68-76). Righteousness is not a state to be reached when one can say, “Ah, now I’ve arrived – I am righteous and holy!” Rather, it is an ongoing creative act of being in relationship. Personally, I like to define it as “…being in right relationship with our Father; seeking to walk creatively and passionately in obedience to His will; in love desiring to please Him”. A relationship is never static. It is always in a state of evolution and change; it either grows and strengthens or weakens and fades. To be in right relationship requires the same constant attention and loving involvement that a good farmer bestows upon his crops. Dear companions in the study of His precious Word, “…it is my prayer that your love may abound more and more, with knowledge and all discernment, so that you may approve what is excellent [perfect], and may be pure and blameless for the day of Messiah, filled with the fruits of righteousness which come through Messiah Yeshua, to the glory and praise of God our Father” (Philippians1:9-11). Amen.